We’ve always known that Facebook and Google were behemoths in digital advertising. It didn’t happen overnight, and we all saw it coming. But there’s been lots of talk lately about “the duopoly,” and many are decrying the massive upper-hand the two companies currently have in the industry. 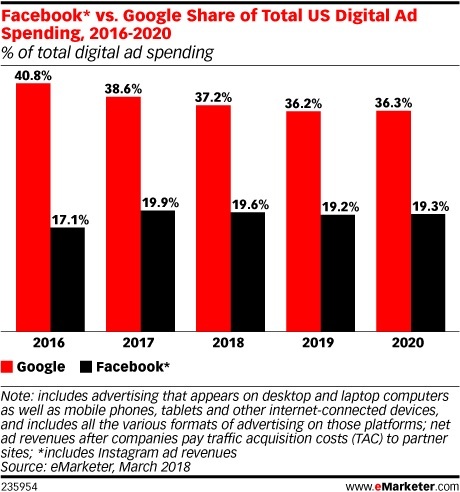 Earlier this year, an eMarketer report predicted the two companies will capture a combined 56.8% of US digital ad investment in 2018. And while that number is down (only slightly) from last year’s 58.5% and expected to continue declining in future years, they’ve still managed to capture more than half of the US digital ad market. And it’s got a lot of people up in arms. Publishers need money to produce great content. Subscription models might work for the biggest of the big publishers, but a 2017 Reuters Institute survey showed that 79 percent of readers said it was “somewhat or very unlikely” that they’d pay for online news in the future. That means most, then, are left with no choice but to make advertising work. But with Facebook and Google’s clear advantages in scale, identity data and incredible ad tech—why would advertisers spend elsewhere? It’s a question that continues to leave publishers scrambling for their piece (crumbs, if we’re being honest) of the revenue pie. Google and Facebook have not only made their ad inventory accessible, they’ve made it so easy to purchase that even the most novice of marketers can navigate their own way to a published ad. 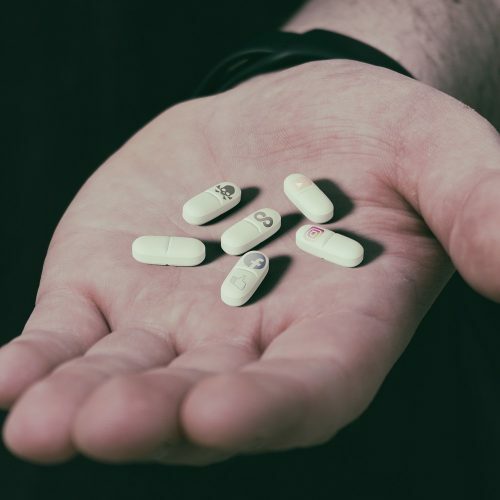 This means that as The Duopoly continue to create efficiencies in their offerings, agencies—once heralded as trusted advisers and experts of the overwhelming digital ad landscape—are becoming less leveraged. Ad blockers, one would think, are a universal threat to the industry, but once again—not so for Google and Facebook. These companies and their seemingly limitless capital resources can out-innovate ad blockers, and pay to play where they can’t out-innovate. When a smaller, niche site with valuable content is forced to shut down because it can’t generate revenue or pay to play with the big boys, an internet fairy loses its wings. We all love the internet because it’s able to provide each of us—no matter how obscure or varied our interests—content that informs, educates and entertains. When you take away the diversity of the content suppliers, everyone loses. Many think that Amazon, ever the disrupter, has the resources and expertise to dismantle The Duopoly, given their ability to compete on the previously mentioned advantages of scale, identity data and ad tech. All these factors presently combine to put Amazon in fifth place among the top digital ad sellers in the US. And, according to eMarketer’s senior forecasting director Monica Peart, they’re on track to be number three by 2020—surpassing both Oath and Microsoft. Amazon seems to be the biggest, most serious threat, but another contender for disrupting The Duopoly (albeit not any time soon) is Snapchat. According to the same eMarketer report, Snapchat’s US ad revenues will jump 82% this year to secure a 1% share of US digital ad spending (with projections to hit 3% by 2019). It’s a far cry from the 37.2% and 19.6% share enjoyed by Google and Facebook, but there’s hope in the fact that companies like Snapchat are at least clawing for a seat at the table. This recently published optimistic article on AdWeek purports that MNOs could be the answer to greater diversity in ad tech offerings. 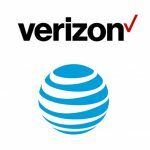 The recurring theme of scale, identity data and cutting-edge ad tech again returns to the conversation, as MNOs already have the first two, and are moving quickly on the latter: both Verizon and AT&T have made moves into ad tech in the past 18 months. Think about it: MNOs have access to huge audiences and tons of data about their mobile browsing habits and behaviors (including in-app and browser interactions, as well as location information). Paired with powerful ad-tech capabilities, these companies have the potential to produce better audience segmentation and personalized targeting in real time and at scale. Some say there’s no solution to this problem; that we just have to accept it for what it is. But not everyone has thrown in the towel and ceded to the almighty Duopoly. There is still hope. When we take off our consumer hats and put on our marketer hats, we tend to forget that the decisions we make about where and how we spend our dollars sends a signal to the market. You get your produce at the farmers market, instead of a large grocery chain, because you want to support the local growers in your community (and because the veggies usually taste better). You boycott a brand whose politics you disagree with because you don’t want them to use your money to fund activities you don’t support. Why, then, do marketers continue to spend so much of their budgets with Facebook and Google, when they would love to see more variety, more innovation and a more fair and competitive ad market? Even more staggering: advertisers pay, on average, 800% more to Facebook than most publishers. Stop spending with them because it’s easy and because it’s what you’ve always done. Take the time to research and vet newer, cutting edge companies. Take a chance on a product you’ve never used before. You don’t have jump The Duopoly ship altogether, but remember you can get to a better place by way of other boats, too. Just last month, Google’s former ads boss, Sridhar Ramaswamy, told Silicon Republic that “trust is the biggest issue facing the web” right now. He praised GDPR and it’s enforcement mechanism for taking steps to elevate user security standards for the entire digital ecosystem. Indeed, GDPR has been an effective slap to the industry’s face with regard to protecting consumer privacy, and similar efforts are taking place outside of the UK. In June, California passed what CNN called “the nation’s toughest data privacy law.” Meanwhile India continues to work on their own data protection bill, as does Brazil. All this not only threatens The Duopoly as regulation continues to reign them in and level the playing field, but it also sends the right signal to consumers: that the industry actually does care about their privacy and is committed to protecting it. There’s power in numbers. No individual publisher can stop The Duopoly on their own, which is why we’re starting to see more and more alliances pop up across the globe. Condé Nast and Hearst joined forces to create PubWorX, in addition to joining the DCN’s cooperative digital advertising marketplace, TrustX. The Pangaea Alliance linked up with technology partner AppNexus and touts big names like The Guardian, CNN, Inc. Magazine and more. New York Media, PopSugar and Rolling Stone are all joining Concert, a digital advertising marketplace operated by Vox Media. 1XL is comprised of most of the UK’s regional newspaper groups and operates nationally. These are just a few of the many publisher alliances to arrive over the past couple of years. While publishers do their part to band together and create safer and more effective advertising environments, other key players in the industry can and should partner to pool their resources and create novel experiences for consumers, like this example of Snapchat and Amazon teaming up to introduce a feature that lets you easily buy products on Amazon that you encounter in real life. It’s going to take all the Davids of the world to defeat the Goliath grip that The Duopoly has on the advertising market right now. To be clear—Google and Facebook aren’t going anywhere, and nobody’s taking them down. But they are taking a disproportionate share of the market, which could benefit from increased competition and industry innovation. So step up to the plate to vote with your dollars, create valuable advertising that restores consumer trust, and band together with your fellow adtech brethren to take back what’s rightfully yours.